Planning a trip to an unfamiliar city can be a daunting and overwhelming task but if you’ve decided to head to Bartlesville, Oklahoma, we’ve got you covered. There is SO much to do from shopping, eating, to museums and everything in between! Whether you prefer to shop till you drop or exploring the city all weekend long, we’ve included our top picks for 48 hours in Bartlesville! Starting off at our Inn, we’re so happy to welcome you to Bartlesville. We are a short 36-minute drive to Pawhuska, 12 minutes to downtown Bartlesville, and only 10 minutes to downtown Dewey! Feel free to grab some breakfast in our dining room before you head out to start your day. Don’t forget to ask us about our favorite restaurants and stops around town! This amazing guided tour leads you through three floors of the impeccably maintained home of Frank Phillips. Located only 15 minutes from BarDew Valley Inn, this is a tour of the non-classical home of Frank Phillips, one of America’s most fascinating oil men! This house is jam-packed with 26 rooms that have been authentically preserved since 1909. While enjoying the mansion, you can learn about the history of Bartlesville and Frank’s life, too! Hours of operation are Wednesday – Saturday, 9:30 AM – 4:30 PM. Only 13 minutes away from the Inn, The Price Tower Arts Center is a celebration of art, architecture, and design – it’s an art connoisseurs dream! A skyscraper originally designed by Frank Lloyd Wright, this is a landmark that has been around since 1956. There are so many different exhibitions on the first two floors and you can even view the original interiors when this building functioned as an office for the Wright brothers. This is a must-see on your trip to Bartlesville! You can schedule a tour Tuesday-Friday at 11 AM and 1 PM. Saturday tours are offered at 11 AM, 1 PM, and 2 PM. Sunday tours are offered at 2 PM. The Bartlesville Area History Museum is a landmark that has been around since the Oklahoma oil boom and is located only 15 minutes away from the Inn. This museum houses some of Bartlesville’s most precious photographs, mementos, artifacts that unfold the beauty of Bartlesville then and now. You can spend hours inside this museum and learn the stories of men who worked in agriculture, bankers, school teachers, oilmen, and everything in between! This is a must-see for all you history buffs. Hours of operation are Monday – Friday 10 AM – 4 PM. Located only 12 minutes from the Inn, this is a must-see while visiting BarDew Valley Inn! This amazing museum, full of multiple exhibitions that outlines the history of Phillips’ innovation, the journey of a very risky road to success, and how they made their way to sports stadiums and street corners. The best part is admission is free and they are open Monday – Saturday from 10 AM – 4 PM. Before you head out of the door, make sure you grab some breakfast with us at the Inn! We serve a scrumptious breakfast that will be prepared for you in our dining room at 9:00 a.m. Interested in oil wells and how they work? Nellie Johnstone is perfect for you! Only a 13-minute drive from the Inn, this is an amazing replica of Oklahoma’s very first commercial oil well! The kicker? You can view a drilling rig in operation! The well is open Monday-Sunday and they’re hours of operation are 6 AM – 11 PM. Located a short 23-minute drive from the Inn, WOOLAROC is one of our favorite spots in Northeastern Oklahoma! Another retreat that belongs to an oilman, this is an almost four-thousand-acre preserve, full of exotic wildlife, native to our part of Oklahoma. This is such a great way to get back to nature and experience a once-in-a-lifetime opportunity. WOOLAROC is open Wednesday – Sunday during 10 AM – 5 PM. If you’ve been looking for a little town that looks like it was frozen in time, Prairie Song is that place! A short 23-minute drive from the Inn will land you in one of the most one-of-a-kind experiences you’ll ever find. This beautiful venue has done an amazing job at preserving the heritage of this land and includes a saloon, trading post, and hardware store. For tour information, call Prairie Song at (918) 534 – 2662. Before Dinner: You can visit either of these or even do both before heading back home! Located just outside Bartlesville, Osage Hills State Park is only an hour away from the Inn and it’s worth every minute of the drive. Osage Hills State Park is beautiful beyond words and is a great way to see a small piece of the beauty of Oklahoma. This state park has something for everyone, too! A trail for your favorite hiker and bikers, tennis courts, and even wildlife for your favorite nature photographer! Can you think of a better way to end your trip to Bartlesville? They are open 7 days a week, from 8 AM – 4:30 PM. If you’re a nature lover, you’ll love the Tallgrass Prairie located about 40 minutes away from BarDew Valley Inn. This is easily one of the most peaceful and serene places you can find yourself. Full of lush grass, with acres and acres of mother nature and wildlife as far as the eyes can see, this is an experience you can’t get anywhere else! Their hours of operation are 8:30 AM – 4:40 PM, open 7 days a week. We hope you get the chance to enjoy everything our little slice of heaven has to offer! 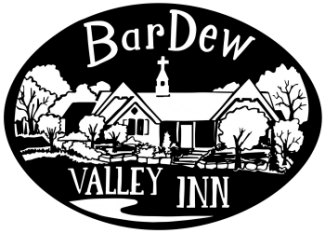 Here at the BarDew Valley Inn, we love What are some of your favorite spots to hit in and around Bartlesville? Let us know in the comments below! Looking for ideas of additional possibilities in Bartlesville? Check out our Things to Do page. Such a beautiful and relaxing B&B. Beth and Perry are great hosts. Our family event was flawless.